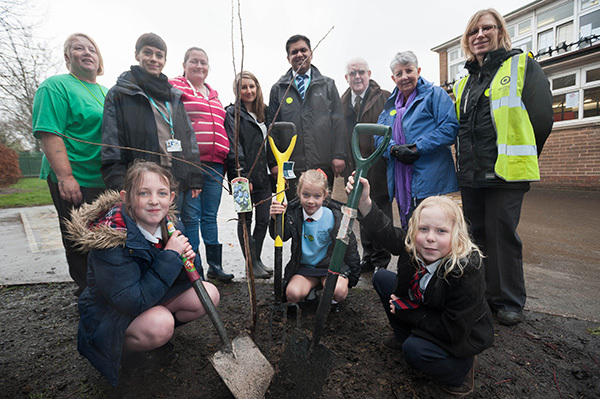 Alt Primary School and St Hugh’s C of E Primary School in Oldham have had fruit trees planted on school grounds as a thank you for taking part in a recycling campaign. Both schools participated in the Recycle for Greater Manchester European Union LIFE+ funded project, Up and Forward, where residents living in Alt and Holts were rewarded with a golden ticket every time they put their recycling bins out for collection with the correct items inside. The schools then had to compete to see who could collect the most tickets. As part of the Oldham Council backed campaign, the Up and Forward team has been working with Carbon Creative, a design and print company to create all the communication materials. Carbon Creative run a carbon offset scheme which means everything produced by the Up and Forward project is offset by tree planting. Pupils from the schools were assisted with the tree planting by the Up and Forward team, Oldham Council staff and local councillors. L-R: Jo Stanley (Oldham Council), Abigail Reed (GMWDA), Mrs Kelly (St Hugh’s), Cllr Zahid Chauhan, Cllr Hugh Mc Donald, Cllr Jenny Harrison and head teacher Mrs Burnley planting fruit trees with pupils from St Hugh’s Primary School. 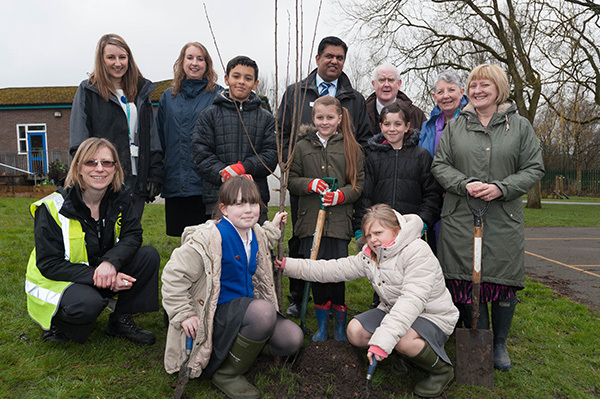 L-R: Mariea Maguire (Alt Primary), Lisa Capelli (GMWDA), Steph Wilde (Alt Primary), Abigail Reed (GMWDA), Cllr Zahid Chauhan, Cllr Hugh McDonald, Cllr Jenny Harrison and Jo Stanley (Oldham Council) helping Alt Primary School pupils plant fruit trees.